All orders received by 8PM EST will be shipped the next day. All USPS Express Mail and UPS Next, 2nd or 3 Day Select, received before 12PM EST will be shipped the same day. If there will be a delay, we will call you and send an e-mail, so please be sure to give us a telephone number and e-mail address where you can be reached during the work day. YOU HAVE A CHOICE as to the shipping method used to deliver your order to your doorstep. If shipping cost is a priority please note that contrary to popular opinion, UPS may not be the least expensive method for shipping, especially with lighter weight orders. Please check the costs for each shipping option before submitting your order. The United States Postal Service will be the quickest ground delivery service depending upon your distance from Atlanta, Georgia. USPS also still makes Saturday deliveries, whereas UPS delivers only Monday thru Friday. please give us a call at 770-939-4531 for expected deliver times to your zip code. International Orders, Australian Orders, Declined Credit Cards and Gift Card Payments Please read the information below before placing your order. 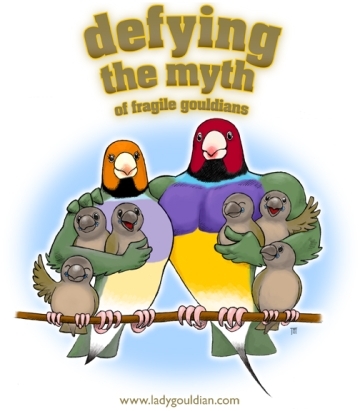 I have made the decision to design my website to provide you with informative articles that will help you understand the needs of your Lady Gouldians. If you make the decision to place an order with us, it will be our pleasure to serve you. However if you make a decision to place your order elsewhere, that is okay too. My main concern is that you understand what you need to order to best take care of the health and well being of your birds. To this extend, I have not specifically mentioned any particular products within my articles, unless the article itself deals with a particular product line of supplements. Each product that we sell has its own FACT SHEET which will give you needed information about that product. To see the Fact Sheet related to a particular product, click on the photo of that item within the Shopping Cart format. You can add the item to your Shopping Cart from the Fact Sheet page, or return to the main Shopping Cart menu to look for additional items or information. While you are shopping at www.ladygouldian.com, please know that your financial information is totally protected. Your financial and personal information is NEVER shared with anyone. www.ladygouldian.com accepts Visa, MasterCard, Discover and American Express credit and debit cards, as well as personal check, money orders or cashiers checks. At this time we are unable to accept PayPal Payments. Our shopping cart will automatically calculate your domestic shipping charges based upon the shipping method you have chosen. Shipping Charges are calculated by the weight of the package and the distance that it must travel between Atlanta, Georgia and your home or business. You will have a choice of United States Postal Service (USPS) Express Mail or Priority Mail, OR United Parcel Service (UPS) Next Day, 2nd Day, 3 Day Select, or UPS Ground Service. It would be to your benefit to click between the various shipping options to check for the least expensive method, if time of delivery is not that important, UPS Ground normally takes longer than Priority Mail delivery depending upon your distance from Atlanta, Georgia. Also remember that UPS does not deliver on Saturdays, except for Next Day delivery (with additional charges), so Saturday and Sunday will not count if you choose 2nd Day or 3 Day Select as your delivery method. For example: If you place an order on a Friday morning, before noon for a Next Day delivery, you will not receive the package until the end of day on Monday, unless you contact us and ask for a Saturday delivery for an additional charge. The Shopping Cart does not calculate the additional charges for a Saturday Delivery. A 2nd Day shipment, placed and shipped on Friday will not arrive until end of Day on Tuesday. For orders weighing less than 7#, Priority Mail will be the most economical method of shipping. For heavier orders, that will fit into a USPS Flat Rate Box ($12.65 and $17.90) Priority Mail may still save you money on shipping. However the shopping cart cannot calculate which items will fit into one of these boxes. So if you have chosen Priority Mail as your shipping option, and I can save you money by using one of the Regional or Flat Rate Boxes, I will do so automatically every time, and adjust your credit card charge accordingly. If you choose UPS as your shipping method I cannot make this change to a Flat Rate Box automatically, unless you provide information in the COMMENT box within the Shopping Cart that tells me that Priority Mail is a shipping option you would like to take advantage of if it is less expensive than the option you have chosen. If you are ordering one light weight item (Scatt, Leg-bands, small bottle of Liquid Iodine) Priority Mail will always be the most cost effective option to choose, If you receive postal delivery at your “Ship To” address. Additional Weight Charges: If you are ordering the 25# bags of our Finch Seed Mixes...they are NOT drop-shipped for us by our seed vendors, we ship them ourselves so the shopping cart will accurately calculate these shipping charges. Charges for these items WILL be calculated into your invoice total at the time that you place the order. The shipping charges given at the time your order is placed on-line are only “estimates” so we will adjust them down if there is any way to possibly save you money on shipping. If for some reason the shipping charges are going to be greater than the estimate given at the time you place the order (i.e. oversized box) we will contact you via e-mail and telephone to get your approval, BEFORE the order is processed. So be sure to check your e-mails regularly and provide current telephone # when you place your order. Your e-mail addresses and telephone #’s will not be shared with any other company and are only for use by ladygouldian.com to contact you about your order. Delays in these delivery time estimates are a result of time that the package remains in Customs. Once the package arrives in your country we have no control over the time it takes to be delivered to your address. You can shop on our secure on-line Shopping Cart using your credit or debit card. All prices listed on ladygouldian.com are in US$. Your financial institution will convert your purchase to your home currency on your credit card or bank statement. Your order may be subject to import duties and taxes, which are levied once a shipment reaches your country. These additional charges must be paid by you; we have no control over these charges and cannot predict what they may be. Customs policies vary from country to country, so you should contact your local Customs office for additional information. Some countries do not allow importation of seed products of any kind. Medication importation is also resitricted in some countries. If you are unsure about such restrictions, please contact your local Customs office before placing the order. If the order is returned to us in usable condition, we will issue a refund for the amount of the products ordered, but the shipping charges are your responsibility. When ordering from ladygouldian.com, you are considered the importer of record and must comply with all laws and regulations of the country in which you are receiving the goods. We are unable to ship any Medications, Supplements or Foodstuffs into Australia without an Import Permit, obtained by you from the Department of Agriculture and Water Resources. To read about Australia's import requirements, see What Goods You Can Import into Australia: www.agriculture.gov.au/import/goods/ . Cage Supplies and books are permitted entry without the Import Permit. Our shipping rates on all orders are weight based. To reflect the policy of the U.S. Postal Service and the United Parcel Service, all weights will be rounded up to the next full pound. Shipping charges for your order from ladygouldian.com will be posted on your invoice. For your protection, all orders shipped through USPS Express Mail International service will be tracked and insured up to the first $100.00 dollars. An additional charge will be added to your credit card if additional insurance is required. If packages coming to your country can not be insured, you assume full responsibility for the order. Your available credit does not justify the amount of the order. The bank that has issued your credit card does not support the approval software allowing our shopping cart to VERIFY YOUR BILLING ADDRESS. If this information cannot be verified, the card will always be declined. This is a very unusual situation. However it does happen. There are non-US issuing banks that do support the approval software because many overseas customers have placed orders with ladygouldian.com without problems. Because “Gift” Credit Cards do not have a customer billing address associated with them, the Address Verification System software cannot verify an address; therefore the transaction will be declined. Ladygouldian.com does accept orders using Gift Credit Cards, but you will need to give us a call to place your order. We can manually enter the transaction amount to get approval. We can be reached on week-days, Monday thru Friday, from 9:00AM to 6:00PM Eastern Standard Time. If you get the voice-mail, please leave a message and we will give you a call back, as soon as possible. We sincerely apologize for this inconvenience. We can be reached via Laraine@ladygouldian.com anytime, or by telephone, week-days, 9:00AM thru 6:00 PM Eastern Standard Time. Voicemail messages left on the week-ends are check throughout the day and emergency calls will be returned ASAP. Disclaimer: All information and products presented herewith is provided on an “As Is” basis, without warranty or the implication thereof. In no event will ladygoudian.com be liable to any party for any direct, indirect, special or other consequential damages by the instructions or products contained within these or connected web pages. The creators of these web pages are not licensed veterinarians. You are responsible for consulting with your vet before taking any actions based on advice/information provided on or linked to this or connected web pages.